ANDRIY.CO - Some advice for beginning entrepreneurs. Some advice for beginning entrepreneurs. With all the multitude of problems, issues, uncertainties related to the registrations in the various institutions of our beloved licensing system, another issue was postponed for the future, so to speak, «on then». Assume that all problems are solved, all «thorns» passed and the stars they are close. The case began, the profits went like this farm to be managed. And here comes a second front of problems and issues. How effective is the company? all the staff are honest? Do not miss our potential clients? And so on ... I think even with a dozen similar questions, you can add yourself. Company «SoftKB» offers a special solution for start-ups. In designing such a system were analyzed typical requests and requirements of users of this group. program should be easy to use. program should be easy to master. program should be easily installed on your computer. program should work reliably and does not require service. program should be accessible and understandable manual. Also, it is desirable to have a set of materials with defined solutions to incorporate in any sphere of activity. program should have a simple set of records. program should not be subject to special requirements to the computer. TCU Start meets all the requirements, as they initially lie in the technical task of the software product. TCU Start rich possess the capability of storing accounting: monitoring balances in real-time recording of procurement and retail prices; record FIFO (the goods from the warehouse is selected in order of receipt) with the possibility of manual selection of parties to the shipment. Revaluation, cancellation and re-balances. The complete history of each item. It has ample opportunities to work with the nomenclature: groups and subgroups of products of unlimited nesting, support for bar-code standard EAN-8 and EAN-13 (self-creation of the bar code and printing), the serial numbers of product-related packaging, weight, volume, control commodity certificates, the quantity in the package (automatically calculated the number of packages), the formation of the price-list and many more. TCU Start has developed means of sorting, searching and filtering data. At this picture, we see how the filter in the list of spending bills. Unique Wizard reports allow you to easily select the desired data and, most importantly, save made by the sample as a template. In this example we can see the customized template for the statement of balances of trade point «Shop Sam» by some chayam. 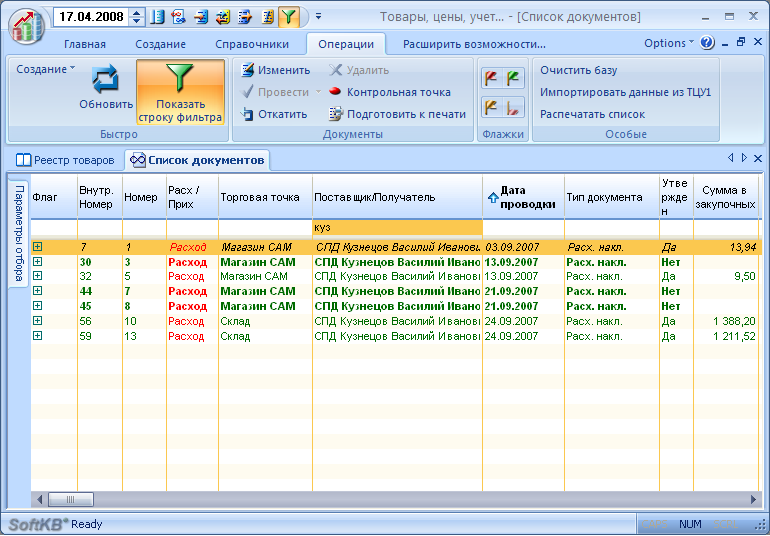 TCU Start - perhaps the first system on the market that uses the new interface of Microsoftpod titled «Ribbon» (Tape), which was used in Microsoft Office 2007. Large, graphic icons, contextual tab, make the program most convenient and efficient. Contextual tabs only appear when needed and provide just the necessary set of commands in each situation. This behavior interface greatly facilitates the work of the user, eliminating him from finding the right team in nested menus. This image shows a contextual tab that appears automatically when you open a form spending bill. 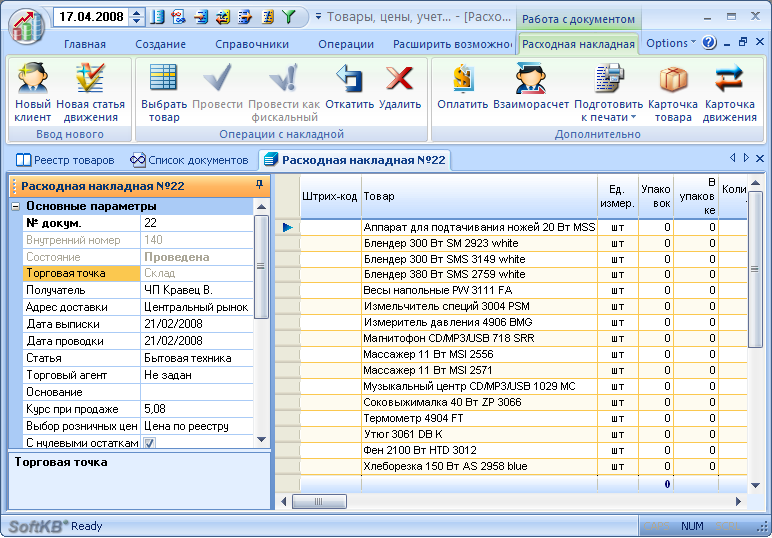 For other types of documents tab content can vary and include your command set. Get started with TCU Start already in the first run. Time for learning is reduced to zero, all the tools at hand. Register TCU Start ABSOLUTELY FREE . designed to take account of the activities of entrepreneurs who have a shop or warehouse, the leading account of not only goods but also the movement of money. Warehouse, insurance and mutual. Three whale any accounting. TCU «Standard» gives you not only a necessary minimum. TCU «Standard» - a balance of simplicity and the wealth of opportunities, the balance of convenience and productivity, balance control and freedom of opportunity. Keeping cash accounting allows you to track sales and cash balances. Arrangements with suppliers and buyers are automatically. 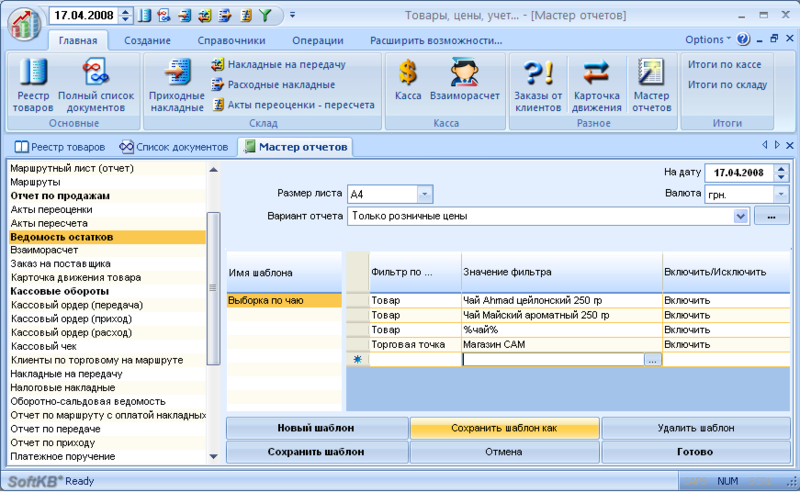 Automatic control of arrears on the timing and amount. The program can be divided into several subsystems, which in combination provide the power and flexibility to meet the challenges of trade and accounting. It has all the features TCU Start. receipt and cash expenditure warrant the possibility of tying payments to invoices, monitoring payments. Arrangements with suppliers and buyers are automatically. Automatic control of arrears on the dates and fees. Designed for businesses and entrepreneurs with multiple warehouses, and (or) shopping, and (or) trade points. The separation of user rights. At this picture we see the general rights of users. Users who work with the program, not tied to a particular machine, just enter your username and password at any workplace office to learn of their rights. Most important right in the system - the right of the administrator. A user with the law may assign the rights of other users. "Writing off the debt" determines whether the user is entitled to write off debts for clients. "Editing guides commodity group" determines whether the user has the right to edit units, groups and items. The right to "edit the directory client group" allows the user to enter new clients, edit existing data, bind customers to groups. "Editing articles directories allows the user to change the name of the movement, add or delete existing ones. "Edit Route" allows the user to modify data on the routes, the tie point to delivery routes, to designate the distance between the points of delivery for calculating mileage route. "Access to the follow-up to the cash register" determines whether the user has the right to view the remnants of Qassam available outlets. Right "Allow ship goods in a negative determines whether the user the opportunity to deliver bolshee quantity of goods than there is now (sometimes you need to, for example, in" peresortitse). "Maximum discount at a cost,%" - defines the maximum percentage discount is entitled to ask the user if this invoice processing expenses. "Retail prices are not lower than the purchase" is another parameter controlling the price, which (if specified) does not allow deliver the goods, if the retail price for it was below procurement. This is especially important with small margins when making the adjustment is easy to delete a retail price below the purchase price. 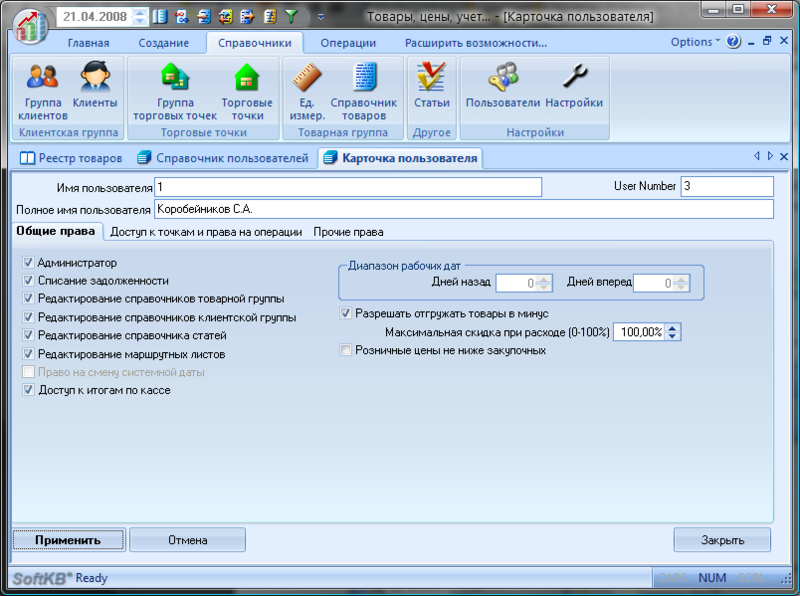 At this picture we see a tab where the user access to the outlets and the right to be appointed to work with documents. 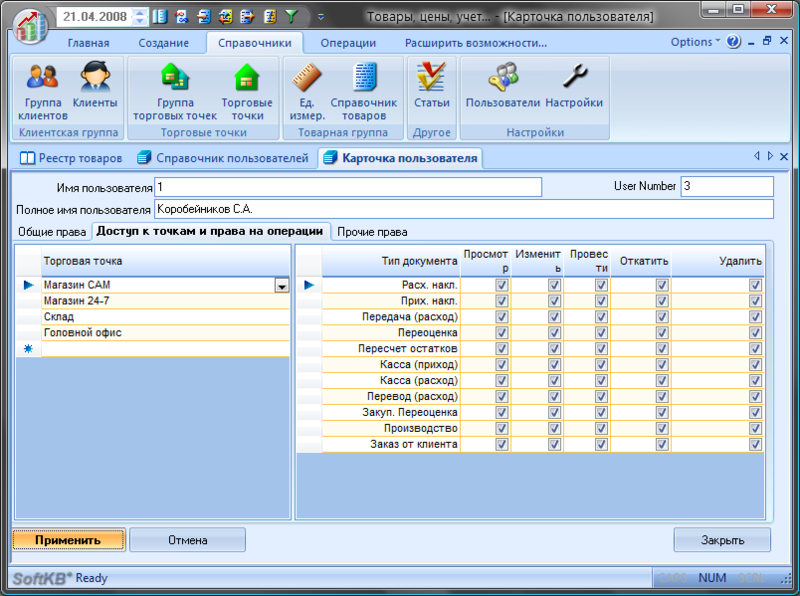 Documents are divided by type, as classified by types and operations, at the intersection of the type of instrument and type of operation the check box asking if the user right granted. For example, the user has the right to edit and perform the receipt overhead, but did not meet the right to haul the parish. At each outlet, the user is given a separate set of rules depending on the type of document. Demo version of "TCU in any edition (except TCU" Start ", which is free and without restrictions), 30 days. After the expiration of the term system requires registration. The cost of registration depends on the wording and number TCU jobs. Program can register at our online store http://andriy.co/shop. 1. Click "TCU" in the upper left corner of the program (such a big, round and beautiful). 2. In the menu click on "Register." 3. In the "key to register" you will see a number combination. Upon confirmation of payment you will be provided with a return key. The return key must be entered in the same field of the registration form (marked with this field highlighted in red). After entering a response key, click "Register". If everything is done without error, will receive a message about successful registration. All vyshi data is stored, you will be able to work without restrictions.